You know a road has a reputation when you tell people you’re going to ride it and they give you a “it takes all kinds” look. Laura’s dad moved to Palm Springs a few years ago and we try to work in a visit to the desert city every time we visit California (especially during the winter). During past visits, I would look wistfully at the mountains that rise out of nowhere on the edge of town and ask, “Where’s that go?” Pointing, of course, to an impossibly straight road that appears to cut a path deep into the mountains. “That thing? That goes to the tram. You’d have to be crazy to ride it on a bike.” And that is how minor obsessions begin. In 2013, Tramway Road was featured in stage 2 of the Tour of California. It was an exciting mountain-top finish after a long hot day of riding. Riders had been moving at breakneck speeds through the flat desert valley. Once they made a left to go up Tramway, all hell broke loose, and the peloton shattered like a beer bottle in a bar fight. The swarming group was thinned out and the Columbian rider Acevedo edged out the American Tejay van Garderen when the road got stupid steep. For us, watching bike races through flat lands is a bit of a yawn fest, but watching them suffer in the mountains is a beauty to behold. It’s hard for us to relate to bike racers as they hammer at 30mph on the flats, but when they are defying gravity and willing their bodies up mountain peaks it is somehow more universal, it reveals the human condition. The ride report on Tough Ascent was written in 2010. While the vertical geometry of the road hasn’t changed since then (it is still a straight and steep climb with the steepest sections at the end), the road itself has been much improved. Recently repaved, the road surface is now silky smooth and makes for a great uphill experience and a very exciting descent (to say the least). Also new to the road is the addition of a really wide walkway that is separated by a concrete curb! This makes it wonderful for walking or running. When we were out on the Tramway, it was being well used, so kudos to Palm Springs for turning an otherwise featureless road that only cars could enjoy into something that is great for more users. Back to the riding. After a few days of walking around downtown and enjoying some great food (Bill’s Pizza, by the way, is awesome and offers GF pizzas and craft beer, although service can be slow), we decided to tackle the hill. To beat the warmer temperatures and especially the traffic, we started out fairly early. We’d recommend getting to the base of the climb probably no later than 8am, if not earlier. The ride itself is pretty straight forward. You go up. Since we were riding early enough, the traffic was extremely light and we could ride side by side and talk. There are very few turns and it’s essentially straight, so it can be a bit disheartening when the point in the distance moves towards you at a glacial pace. A better strategy is to look around while spinning. It’s easy to imagine the desert as a flat and featureless plate of sand, but this road shows that it is anything but. The mountains, particularly during the early morning light, cast some magnificent shadows. Even better views can be had if you stop and turn around. It’s easy to focus on the slowly moving road beneath you, but you’ll miss the best part – spectacular views of the valley below. The riding is challenging but not impossible (especially if you are used to riding hills and have good gearing). For most of the climb, the grades were pretty reasonable. At some point near the top, you are greeted with a ticket booth and entrance of sorts. This is NOT the top, though it is tempting to stop there and turn around. It is also about here that the road kicks up a bit more and will cruelly test your lungs and legs. This is where, as Phil Ligget would say, we were experiencing a “spot of bother.” Fortunately there wasn’t too much further to go and we pushed on. The top is actually quite anti-climactic from a scenery perspective. There is the tram station and a tram car where you can take pictures, but the views of the valley are occluded by the mountains. After a few quick snaps, we put on our jackets and began the screaming descent back into Palm Springs. As you go back into town, you get some spectacular views of the desert valley and wind farms in the distance. Palm Springs isn’t the kind of place that often makes it on top bicycling lists, but the Tour of California put it on center stage. From what we have heard, the city is slowly moving forward on becoming a more bikeable city. In our opinion, it makes a great winter cycling destination for anyone escaping colder climes. 80 degrees and sun in the middle of winter? Yes please! 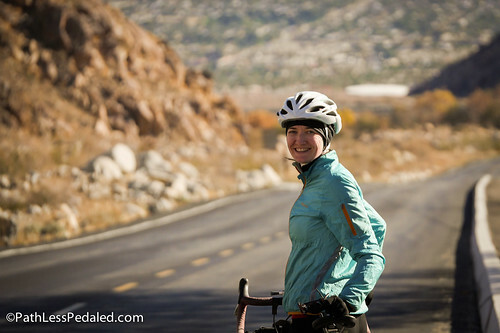 We toured through the desert cities a few years ago and it felt pretty bike inhospitable, though there were some true gems like Box Canyon Road to Mecca and the road that traverses Joshua Tree. If Palm Springs continues down the path of slowly becoming more bike-friendly, it could really be a cycling oasis in the middle of the desert. It’s a big disappointment that bicyclist are no longer allowed to ride past the ticket/toll booth. Ah. The unmistakable voice of Phil Liggett. One of my favourite cycling commentators (Paul Sherwen and Carlton Kirby are also favourites of mine). What an absolute brutal climb!